Phenacetin (or acetophenetidin) is a pain-relieving and fever-reducing drug, which was widely used between its introduction in 1887 and the 1983 ban imposed by the FDA on its use in the United States. Its use has declined because of its adverse effects, which include increased risk of certain cancers and kidney damage. It is metabolized as paracetamol (acetaminophen), which replaced it in some over-the-counter medications following the ban on phenacetin. Phenacetin was introduced in 1887 in Elberfeld by German company Bayer, and was used principally as an analgesic; it was one of the first synthetic fever reducers to go on the market. It is also known historically to be one of the first non-opioid analgesics without anti-inflammatory properties. Its analgesic effects are due to its actions on the sensory tracts of the spinal cord. In addition, phenacetin has a depressant action on the heart, where it acts as a negative inotrope. It is an antipyretic, acting on the brain to decrease the temperature set point. It is also used to treat rheumatoid arthritis (subacute type) and intercostal neuralgia. It is metabolised in the body as paracetamol (acetaminophen). The first synthesis was reported in 1878 by Harmon Northrop Morse. Phenacetin may be synthesized as an example of the Williamson ether synthesis: ethyl iodide, paracetamol, and anhydrous potassium carbonate are refluxed in 2-butanone to give the crude product, which is recrystallized from water. 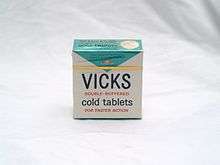 Vicks cold tablets, containing: Salicylamide, phenacetin 2½ grs., Pyrilamine Maleate, Caffeine, Ephedrine Sulphate, Magnesium Hydroxide, Aluminum Hydroxide Complex (U.S. Pat. 2,446,981). That patent number is from 1948; these tablets would have been made shortly thereafter. Phenacetin was widely used until the third quarter of the twentieth century, often in the form of an "A.P.C." or aspirin-phenacetin-caffeine compound analgesic, as a remedy for fever and pain. An early formulation (1919) was Vincent's APC in Australia. However the U.S. Food and Drug Administration ordered the withdrawal of drugs containing phenacetin in November 1983, owing to its carcinogenic and kidney-damaging properties (Federal Register of October 5, 1983 (48 FR 45466)). It was also banned in India. As a result, some branded, previously phenacetin-based preparations continued to be sold, but with the phenacetin replaced by safer alternatives. A popular brand of phenacetin was Roche's Saridon, which was reformulated in 1983 to contain propyphenazone, paracetamol and caffeine. Coricidin was also reformulated without phenacetin. Paracetamol is a metabolite of phenacetin with similar analgesic and antipyretic effects, but the new formulation has not been found to have phenacetin's carcinogenicity. Phenacetin, and products containing phenacetin, have been shown in an animal model to have the side effect and after-effect of carcinogenesis. In humans, many case reports have implicated products containing phenacetin in urothelial neoplasms, especially urothelial carcinoma of the renal pelvis. In one prospective series, phenacetin was associated with an increased risk of death due to urologic or renal diseases, death due to cancers, and death due to cardiovascular diseases. In addition, people with glucose-6-phosphate dehydrogenase deficiency may experience acute hemolysis, or dissolution of blood cells, while taking this drug. Acute hemolysis is possible in the case of patients who develop an IgM response to phenacetin leading to immune complexes that bind to erythrocytes in blood. The erythrocytes are then lysed when the complexes activate the complement system. Chronic use of phenacetin is known to lead to analgesic nephropathy characterized by renal papillary necrosis. This is a condition which results in destruction of some or all of the renal papillae in the kidneys. One notable death that can possibly be attributed to the use of this drug was that of the aviation pioneer Howard Hughes. He had been using phenacetin extensively for the treatment of chronic pain; it was stated during his autopsy that phenacetin use may have been the cause of his kidney failure. ↑ "Drugs banned in India". Central Drugs Standard Control Organization, Dte.GHS, Ministry of Health and Family Welfare, Government of India. Retrieved 2013-09-17. ↑ Luba, Frank (31 July 2014). "Used cocaine lately? It may have been mixed with a pig deworming chemical". Toronto Star. Retrieved 24 September 2014. ↑ Dubach U, Rosner B, Stürmer T (1991). "An epidemiologic study of abuse of analgesic drugs. Effects of phenacetin and salicylate on mortality and cardiovascular morbidity (1968 to 1987)". N Engl J Med. 324 (3): 155–60. doi:10.1056/NEJM199101173240304. PMID 1984193. ↑ Cochran A, Lawson D, Linton A (1967). "Renal papillary necrosis following phenacetin excess". Scott Med J. 12 (7): 246–50. PMID 6036245. ↑ Tan G, Rabbino M, Hopper J (1964). "Is Phenacetin a Nephrotoxin? : A Report on Twenty-three Users of the Drug". Calif Med. 101 (2): 73–7. PMC 1515485 . PMID 14180501. ↑ Brix A (2002). "Renal papillary necrosis". Toxicol Pathol. 30 (6): 672–4. doi:10.1080/01926230290166760. PMID 12512867. ↑ Tennant, Forest (July–August 2007). "Howard Hughes & Pseudoaddiction" (PDF). Practical Pain Management. PPM Communications. 7 (6): 20. Retrieved 2 November 2015. The phenacetin in the codeine compound produced, over time, kidney failure and death.